It’s a Friday afternoon and two young men from the suburbs are looking for a place to crash later that night, after hitting up the bars in Andersonville and Uptown. A friend recommended The Lodge Motel at Foster and Sheridan. Yet as they drive by it all they see is a vacant lot. Looks like nobody figured to tell them it was torn down to make room for a new Dominick’s. 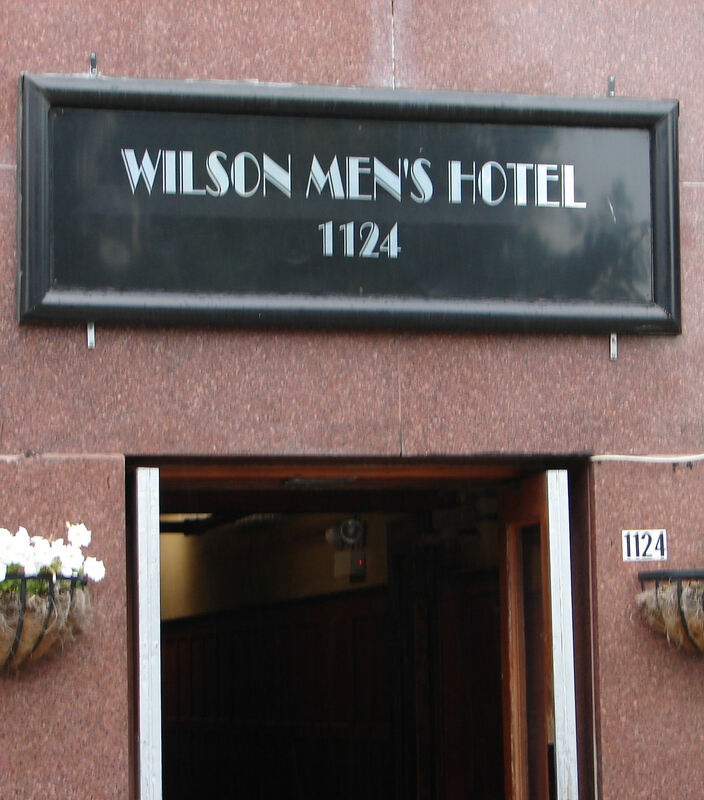 An accidental visit to the Wilson Men’s Hotel may scare off unsuspecting, if apocryphal, visitors today, but the Near West Side, Chicago’s legendary Skid Row, is no longer “Land of the Living Dead,” as Time magazine described it in 1949. From the onset of the Great Depression until the late 1980s, the area centered on Madison Street, loosely reaching from Lake Street to Van Buren and Clinton west to Damen, was largely an unchecked haven for alcoholism, poverty, crime and down-and-outers from all walks of life. In its heyday, if you walked four blocks down Madison Street, you would wade through a sea of garbage and broken glass and have to step over at least twenty men lying prone on the sidewalk or passed out in the gutter. On warm summer and cold winter nights, the wind blew the stench and filth from vomit and urine up from the gutters and into your face. The history of Skid Row began at the turn of the last century, when two major railroad lines ran along Madison Street and ended in the West Loop at Union Station. Railroad workers, often single men who traveled, needed a place to stay and perhaps have a drink near their home base. Hotels, bars, strip joints and burlesque houses catering to single working men sprung up along the avenue. Soon, the railroad men were joined by others, including migrant workers, ice cutters and part-time laborers who made their living along the rails. During the Great Depression, the group expanded to include hobos and gandy dancers. Gandy dancers earned their name from the dance-like movements they made as they kept the tracks aligned with rods produced by the Gandy Manufacturing Company. Unlike the bums, hoboes and gandy dancers generally had their own code of conduct, usually eschewing severe drunkenness, violence and crime. The Great Depression and the resulting poverty, however, began to eke away at this precariously peaceful existence. The area became a no-man’s land that police mostly left alone, just as long as the crime did not make its way into the Loop proper. After World War II, thousands of servicemen returned home from the war. Some resumed normal lives with their families. Others, shell-shocked, lonely and suffering from what we now know as post-traumatic stress disorder, could find no counseling and turned to alcohol. Many ended up on Skid Row. The numbers are far from exact, as bums drifting in and out weren’t the type to have their names listed in phone books, on mailboxes or on census forms, but the article in Collier’s estimated the population varied between 7,000 people in the summer up to 15,000 in the winter. During the winter, the men lived in a series of flophouses and cheap hotels, the latter often sporting names suggesting paradise and fantasy. Even today, old-timers still reminisce about haunts like the Workingmen’s Palace, the Gem, the Starr Hotel, the New Norway and the Portland. The rooms, usually six-by-four feet and topped by chicken wire, were dubbed “bird cages.” The nicer rooms had windows, doors and electric lights. Besides winos, the only regular visitors to these hotels were the Chicago Police, who picked up ne’er-do-wells and drunkards in a paddy wagon, and hearse and ambulance drivers, who made daily rounds, moving the dead and dying to pauper’s graves. Cheaper brands of beer sold in taverns along Skid Row, like Blatz, Ballantine Ale, Red, White & Blue, Stag, Drewry’s, and now-defunct local brands like Fox Deluxe, Bismarck Beer, Bullfrog Beer and Ambrosia Lager Beer. But beer was not the drink of choice along the row. Low-end and fortified wine largely fueled Skid Row. Today, BumWine.com provides a detailed list (and scathing reviews) of some of the most popular fortified wines. Their list includes now-defunct brands like Ripple and Sly Fox. But many are still around. Richards Wild Irish Rose, introduced in 1954, is available in 13.9 percent and 18 percent alcohol by volume, and sells almost two million cases annually. According to Bumwine, the “kings of skid row,” Thunderbird and Night Train, are also still widely available in liquor stores today. But when times got really bad on Skid Row, the winos turned to even more sinister potions to feed their addictions. They drank Vitalis and other hair-gel tonics and later NyQuil, for their alcohol content. Many of the winos found part-time work washing dishes, and got their hands on cans of Sterno, used to warm steam tables. Most of the time people used the cans to heat street corners, doorways and small enclaves during the cold Chicago winters. But when wine wasn’t available, Skid Row residents reduced the solid “canned heat” into a liquid by straining it through a stocking. The result was a highly toxic cocktail known as a Pink Lady. Before ethylene glycol, cars used wood alcohol, or methanol, in their radiators as anti-freeze. On many a night, police caught folks draining the wood alcohol to drink. Known as Jake, wood alcohol did not provide the sense of relaxation usually associated with drinking alcohol. Instead, it provided a dull, numb high, often followed by unconsciousness. As time wore on, the wood alcohol began to attack the drinkers’ central nervous systems. Many of the citizens of Skid Row who worked day labor came to recognize the effects of Jake. Workers’ legs began to shake uncontrollably—Jake Leg. It was the first in a series of tragic symptoms that often ended with men dying like rats on D-Con, their whole nervous system having broken down. The prevailing attitude towards men on skid row and alcoholism in general was that they were lazy losers who deserved it. The reality was that not all men on Skid Row were losers. Many of the men, even the ones police ran into, often had families and formerly worked white-collar jobs. Another pioneer in helping the denizens of Skid Row was Monsignor Ignatius D. McDermott, also known as “Father Mac,” the co-founder of the Haymarket Center. In 1946 he began working on the edge of Skid Row. Over the years he recognized a vicious cycle of men coming to Skid Row, being arrested for drunkenness or vagrancy, going into the “drunk tank,” getting out, going back into the tank, ad infinitum. Slowly, people like Father Mac began to realize that alcoholism was not a lifestyle choice, but a disease. In “Father Mac: The Life and Times of Ignatius D. McDermott, Co-Founder of Chicago’s Famed Haymarket Center,” Thomas F. Roeser writes, “Father Mac began to walk Skid Row nightly, visiting saloons and flophouses to gain the trust of people who were at the lowest points of their lives and to encourage them to seek help and turn their lives around.” In 1963, Father Mac founded the Central States Institute of Addiction (CSIA), turning his efforts on the streets into an institution that provided resources for individuals and groups who helped people with addictions. Father Mac established the CSIA just as America began to better understand addiction and undergo a sea change in attitudes. During the 1960s and seventies, American’s ideas towards “bums” began to change. Alcoholism was now seen as a family disease, and alcoholic men were no longer kicked out of their houses and sent to Skid Row, but instead referred to treatment. The advent of the automobile also changed American’s attitudes. Before the car-centric, suburban age of the 1960s, men confined to places like Skid Row were largely isolated from the rest of the city and society as a whole. The wide-spread use of the automobile, however, led to drunk driving and the resulting deaths of drunk drivers and their victims. Politicians, businessmen and landowners faced ever-mounting pressures to tear down Skid Row. Meier and Hunt’s answer is no, but for most, the answer was yes. During the eighties and nineties, the former shacks, hotels, bars and businesses along Madison Street fell like dominos. The new United Center ushered in a series of bars, restaurants and, later, housing along what was once the west end of Skid Row. 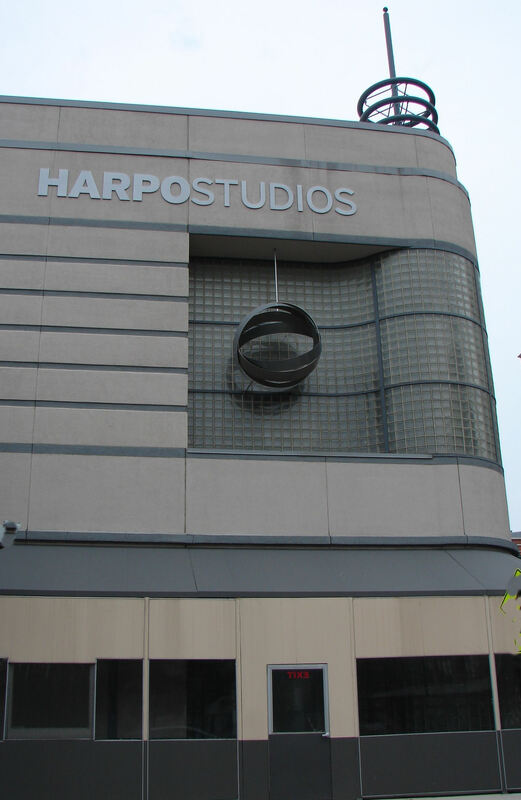 But the coup de grace was Oprah Winfrey’s Harpo Studios at 1058 West Washington, established in 1988 in a former armory. The land was cheap, thanks to the location, but the coming of Oprah meant stars like Tom Cruise and Halle Berry walked on the same sidewalk where winos once stumbled through broken glass and garbage. 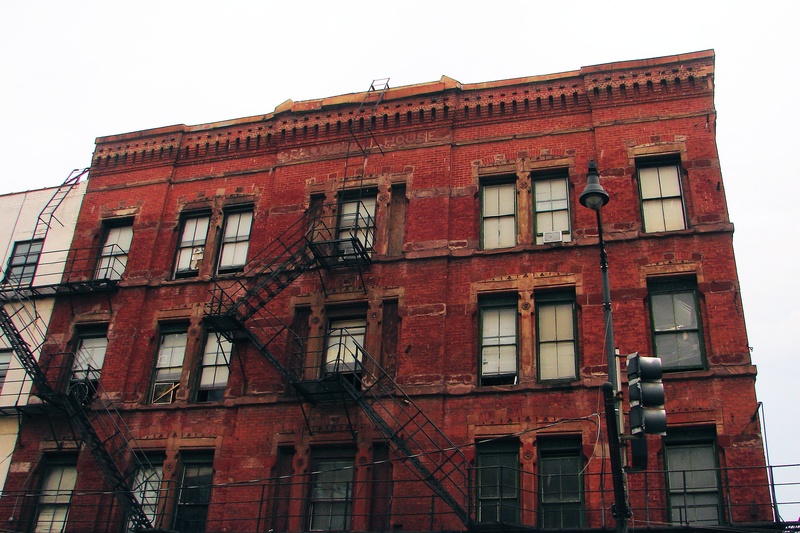 Today there are only a few signs that Skid Row once occupied most of the West Loop. Father Mac’s Haymarket Center stands at 932 West Washington, a block east of Harpo Studios. 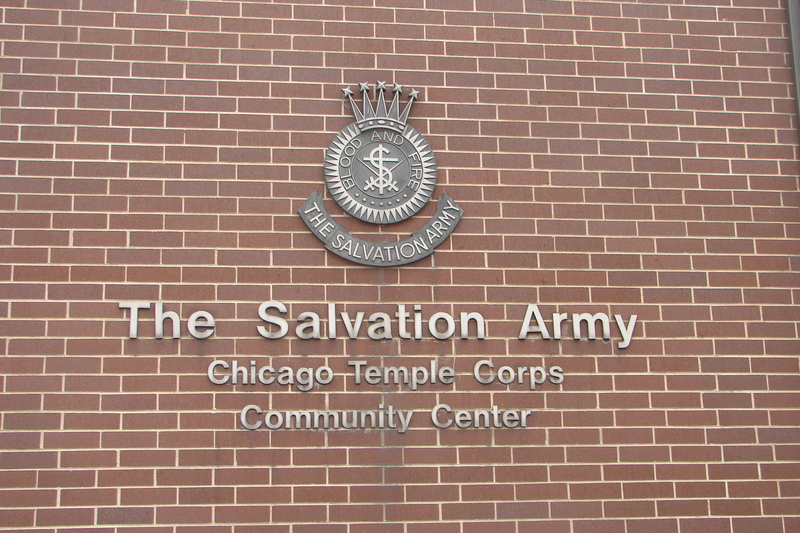 The Salvation Army’s Rehabilitation Center is also close by, at 506 North Desplaines, as is the new home for the Pacific Garden Mission at 1458 South Canal Street. 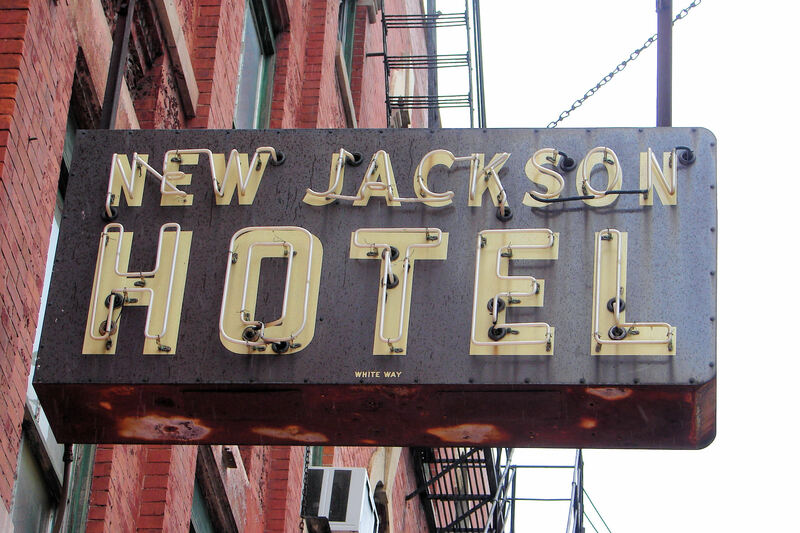 The New Jackson Hotel, at 768 West Jackson, also stands as perhaps the last SRO in what was once Skid Row. It’s not much, but it’s just enough that unsuspecting visitors looking for a good deal may stumble upon one of those last remaining shreds of Skid Row. You can’t experience Skid Row in its heyday anymore, but it’s certainly possible to try.